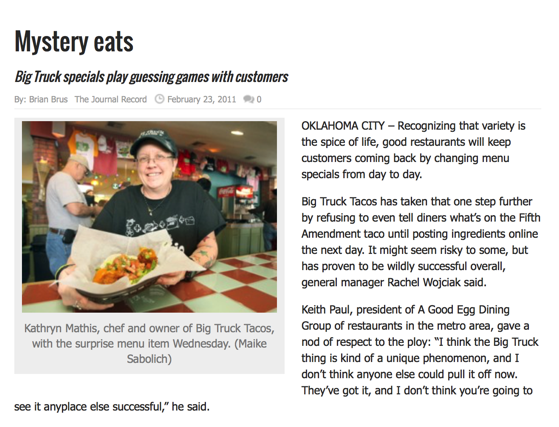 OKLAHOMA CITY – Recognizing that variety is the spice of life, good restaurants will keep customers coming back by changing menu specials from day to day. Big Truck Tacos has taken that one step further by refusing to even tell diners what’s on the Fifth Amendment taco until posting ingredients online the next day. It might seem risky to some, but has proven to be wildly successful overall, general manager Rachel Wojciak said. Keith Paul, president of A Good Egg Dining Group of restaurants in the metro area, gave a nod of respect to the ploy: “I think the Big Truck thing is kind of a unique phenomenon, and I don’t think anyone else could pull it off now. They’ve got it, and I don’t think you’re going to see it anyplace else successful,” he said. And Ken Carlyle, manager at the Coach House restaurant, said he’s never seen such a regularly offered item before. Like most specials at other restaurants, one of the head culinary geniuses plans the Fifth on a daily basis. Sous-chef Kelly Nordeen sees the Fifth as a work of art, Wojciak said. “She’ll come up with these bizarre ideas that everybody just loves. Kelly likes challenging the palette and putting things together that most people wouldn’t consider. And somehow she makes it work,” Wojciak said. And if patrons don’t like being served a mystery? After all, that green topping could be wasabi or green chili crema, for example; meats run the gamut, including roasted rabbit, shrimp, fried quail, bison, salmon, andouille sausage and batter-fried chicken livers. But a refund is out of the question. Big Truck has been making more of an effort to offer daily specials as well, details of which are provided online. Chefs prefer fresh ingredients from local sources whenever possible. Carlyle and others said surprise specials keep regular customers interested. At the Coach House, chef Joshua Valentine prepares a special four-course tasting menu that includes an appetizer, salad, two entrees and a dessert. Other specials are prepared as well. “People like the idea of having a complete meal at a set price with smaller portions so they’re not overstuffed,” Carlyle said. “We’ve had a great response from both sets of our clientele – our regular customers who are the doctors and lawyers of Nichols Hills who consider eating here no big expense, and then there’s the clientele who see this as a one-time special splurge to eat at the city’s four-diamond restaurant. Paul said Cheever’s Cafe sells more specials than any of the other restaurants in the Good Egg Dining Group. Those off-menu items are the responsibility of Executive Chef Mark Ridener, who also shops around for fresh, local ingredients. “We like to plan things out in advance whenever we can,” Paul said. “So if Mark knows a fresh produce item will be available a certain week, he will go ahead and get as much of it as he can so he’s not scrambling to get his hands on it that day. “If you’re planning well, you can get the freshest available,” he said. The same protein – usually meat – will be offered two days in a row at the most, although side items and presentation will vary, Paul said. A well-managed restaurant makes the best use of its resources and doesn’t let fresh ingredients go to waste, possibly parsing out a smaller portion the next day for a different presentation. That way, specials are always intentional creations and not merely repackaged leftovers. Paul said he thinks the Cheever’s brunch specials are more popular than other plates because they’re akin to Southern comfort food. And every so often a special will migrate to the main menu, like the Cowgirl Benedict, which is a skillet potato hash, stacked with chicken fried steak, a poached egg, chipotle hollandaise sauce and an avocado. Online social media has provided yet another new twist on the old concept of specials, which might be part of Big Truck’s Fifth Amendment success. Although Cheever’s Cafe, Coach House and other fine restaurants can now tease customers with photos and descriptions on Facebook and Twitter, Big Truck can follow up the next day with the secret ingredients. So it’s not necessary for customers to come back to the restaurant to find out what they ate, Wojciak said. Even if they did, the counter staff probably wouldn’t know anyway, she said. Employees are never told, so they can’t be pressured to let the secret slip.